Describe what you think is happening in this plaque in your own words. What story could you tell about the scene in this plaque? Unfreeze the scene and put yourself in it. What will you say and do? Why do you think the bronze caster included these people, this person or this object in this scene? Write down questions you would like to ask about this plaque using What, Where, Who, When, Why, How, What if? Imagine a conversation between this plaque and others in the museum. What would they say? Use speech bubbles to show this. 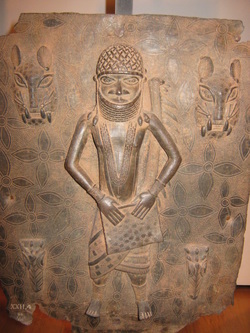 What can you see in this bronze plaque? What can you see happening in the plaque? Who is in the plaque? What time of the day do you think that it is? What do you think happened after this scene? What do you think this person is thinking? What do you think these people could be saying to each other? In your groups, create a tableau of this scene. What is shown in this bronze plaque? Who do you think this object belongs to? What do you think the object is used for? How old do you think this object is? What are this object’s special features? Where do you think this object has been? Do you know an equivalent for this object? Do you think this object is precious to the owner? How do you know? What story could you tell about this object? What information could you give about this object? The same questions can be adapted for use with real objects and artefacts from the Kingdom of Benin. What is your name and what are your duties? 2. Complete a thought bubble for the character. 3. Make a diary entry of their day. 4. In role write a letter to the Oba (king) about an issue concerning the kingdom. Unfreeze this scene; write a paragraph each of what happened during the scene, five minutes before this scene and five minutes after the scene. Combine these into a short narrative. Unfreeze this scene; write a story of what happened before this scene, during the scene, and after the scene. Act this out and video record it. Role play the scene: who are characters? What are they saying to each other? Include speech bubbles of a conversation between two of the characters. Imagine one of the characters is planning his or her next move; write a thought bubble of what he or she is thinking. Thought tapping: Take the role of each character in the plaque; freeze frame the scene; on cue, as one of the characters, say how you are feeling and why. Give pairs of pupils, one plaque each for thought tapping exercise. Each pair present to the rest of the class who should guess which of the characters each person is representing. What questions would you like to ask this object? Can you think of questions other people might ask it? Can you create a poem about the object? Think about its look, colour and shape. Describe how you feel when you look at the object. Could you write a story about the object? You could imagine what it would do if it could move, where it would go? Or what it was before it was a sculpture? You can write what you like; the story is up to you. Can you make a drawing of one of the plaques or objects? Look at what other people have done. 1. Compose questions to ask the characters; include both closed and open-ended questions. Write down what you think their answers might be. 2. Write a sentence about what you can see in the plaque. Start with a simple sentence. To improve, expand it by asking What, How, When, Where, Why, of the sentence. What time was it done? 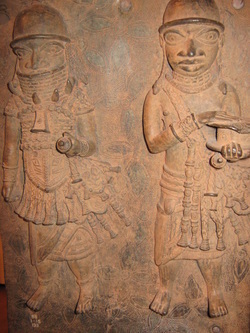 An example: The chief danced. Becomes: The joyous Chief danced all night with his jubilant people who had come to welcome him and his troupes home. Combine three to five simple sentences from the exercises above to form a paragraph. 1. Compose simple sentences from your discussion session above. 2. Group all related simple sentences into paragraphs. 3. Order your paragraphs into sections to complete your composition. Any special event that happens. Your feelings throughout the visit. Imagine that you are one of the Oba’s (King) craftsmen or blacksmith; write a report about an object you made for the king. What do you think other people like about it? What did you gain from making this object? The specialist words you will use. This activity will help your students present their research findings on Kingdom of Benin Trade or other subject matters such as missionaries and explorers. Role play cards: European explorer, trader, missionary and visitor. Divide the class into groups of four and issue a character role play card from above to each. Each group must then research activities of their character on the West African coast and write down notes to inform their Q&A activity below. Which country the European trader/ visitor is from. Possible questions that could be asked to get information on his background and intents. Plausible answers for the time period. 4) Each group should then decide among themselves who will play the four roles in step 2 above. 5) Dressed for their part, each group presents their interview questions and answers to the rest of the class. The artist should draw exact features of the person and the clothes they have on. what they did really well (What Went Well) (WWW). one thing they could have done better (Even Better If) (EBI). 6) All groups should take turns to present their period drama to the rest of the class and to receive feedback on their performance. Create a corner to show part of Kingdom of Benin palace in your classroom e.g. the king's chambers. Keep the scribe notes as part of a European scrap book on their visits to the kingdom of Benin. Frame the artist drawing and display as a Bronze plaque on the King's palace walls. Individual students could write up notes from their presentation for inclusion in their writing folders. The e-learning section of this web site also has a range of subjects teaching ideas.